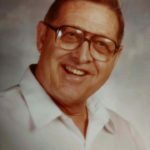 Robert “Bob” Walter Chastain passed away peacefully on the morning of Jan. 5, 2019 in his Chandler home at the age of 95. Bob is survived by sister, Mary Lou Page; children, Linda Prinz, Brenda Garcia, Bobette VanWallene (Matt) and Chandra McDowell (Jim); 11 grandchildren and 10 great-grandchildren. Bob is preceded in death by wife Phosia Chastain, sister Betty Schwartz, brother James Chastain and great-grandchild River VanWallene. Bob was born on Dec. 1, 1923 in Silt, Colorado to Maude and Walter Chastain. He moved to Tolleson, Arizona in 1932. Bob began his educational career at the Tempe Normal School on a basketball scholarship. In 1942, Bob enlisted in the U.S. Marine Corps where he served as a U.S. Marine Raider in World War II in the South Pacific. During his service he was awarded two Purple Hearts. Upon returning to the states, Bob continued his education where he played the first basketball game under the new mascot, Arizona State Sun Devils. He married his college sweetheart, Phosia Smith, a teacher. In the years to follow, Bob was a teacher/superintendent at Stanfield School, Superintendent at Ray Unified Schools for 29 years, served one term as an Arizona State Legislator, and served one term as an Arizona State Senator. Bob was a dedicated individual who loved his family and who was passionate about education and making a difference. His family remembers him as a kind, generous and hardworking man who encouraged and inspired all who knew him. A celebration of life will be held on March 23, 2019 at the Ray Unified School Cafeteria at noon. All are welcome to attend and celebrate Bob’s life. In lieu of flowers, donations can be made to the Chastain Educational Scholarship. Condolences can be sent to the Chastain family at PO Box 1206, Kearny, AZ 85137.